Sooo…how’s your #CLEmarathon training going? It’s been awhile, huh? Remember when I was diligently writing up every run I did? Me neither, it’s been that long. 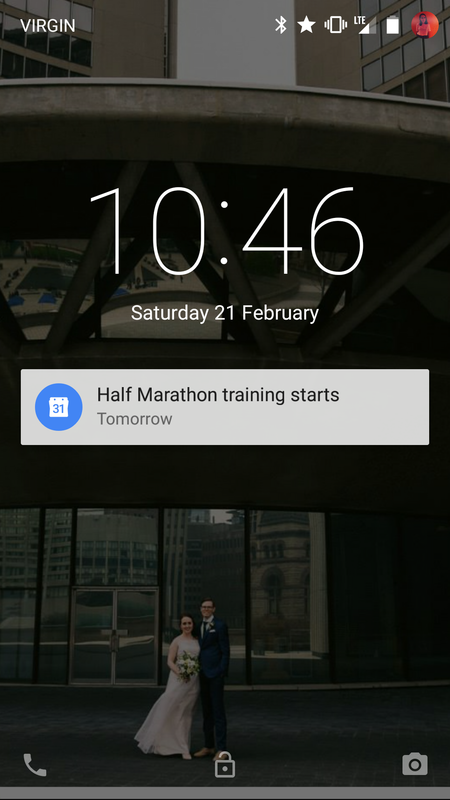 It’s only four days until Jonathan and I run the Cleveland half marathon and, well, I’m undertrained. I’ve been running, I swear! 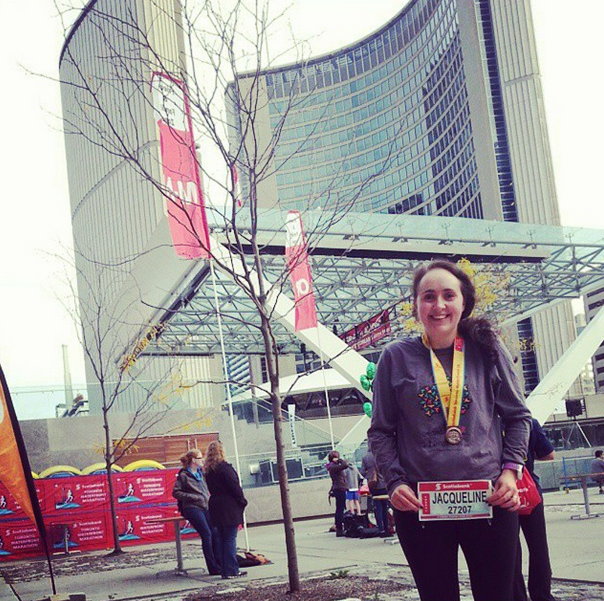 I even ran a 10k race! But I haven’t been running as much as I should have been, or as far as it would have been smart to, and now I’m getting nervous. But dang it, I worked for months! From icy, slippery February nights in Toronto to sunny morning hill climbs in California, I ran a lot, and I want to run this race! Anyway, stuff that voice. I couldn’t run a mile this time last year. I finished my 10k race in under 56 minutes feeling great. If I really, truly can’t do it, I want to find that out on Sunday at mile 12. 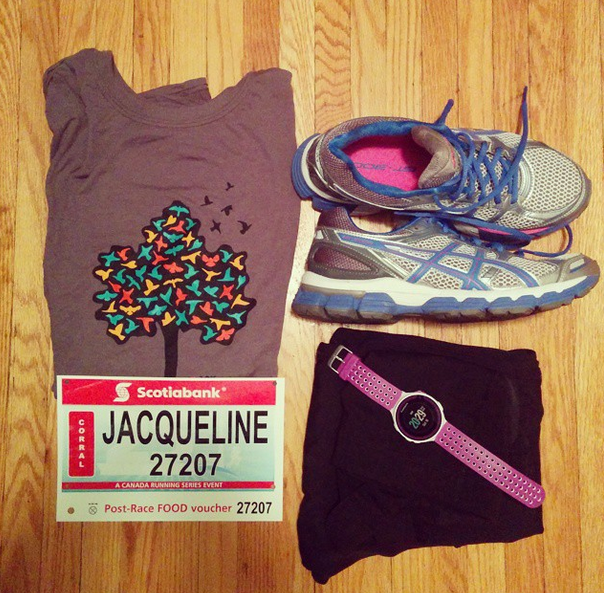 I want to puke and have to sit down on the road, and to walk to the side of the road in embarrassment while people call “you can do it Jacqueline!,” as they always do to the saddest looking runner with their name on their bib. I’ll be really, really sorry if that happens, but at least I’ll know it’s really true. But I hope that doesn’t happen! See you soon, Cleveland! I had my first fall-off-the-wagon day (i.e. didn’t do the training I was supposed to do). I dreaded this happening, because I worried it might be a slippery slope. Welp, it happened, and it wasn’t. I sucked at training for a little while, and then I got the motivation to stop sucking, and I’m back at it. 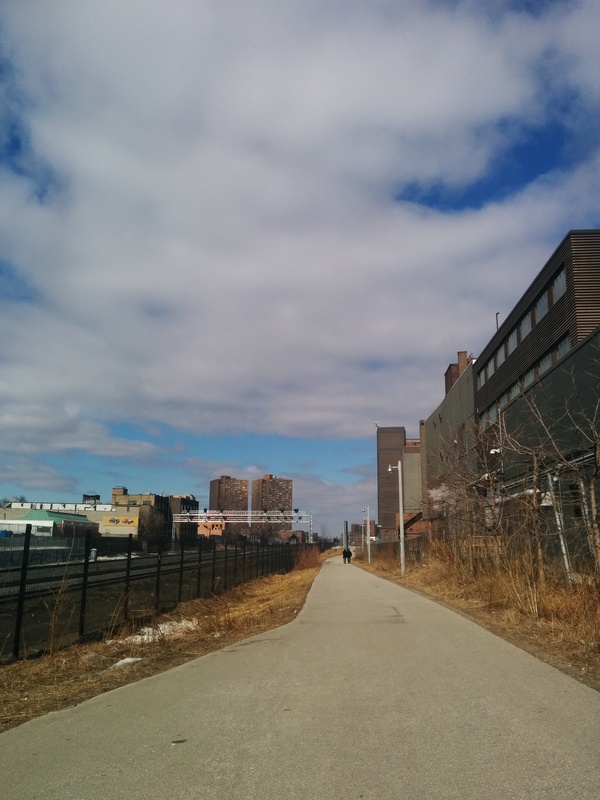 Sunday (March 8) – 7.5 km – I was worried about how my legs would feel the day after my first ski of the season and, well, yup. They hurt. But the weather was glorious and I had a very exciting destination in mind (Nadege for Croissunday! ), so once I loosened up, around the start of kilometre 4, this was a great run. What I wish we wore to the gym. Monday – gym night – My friend Ainsley has almost the exact combination of determination and blase distaste for the gym. We got married within a month of each other and did a lot of planning (and bitching and moaning) on the JCC elliptical trainers in the months leading up to our big days. Now that we’re wives on budgets, we hang out at the Planet Fitness in Galleria Mall. I am lucky to have her in my workout corner. Tuesday – morning 5km – This was less brutal than last week, but still a fairly miserable slog. Given my Sunday long run/Monday night gym combo, I would definitely benefit from pushing this to the evening, but choir calls! I just…I hate running in the morning. I never warm up, and running on empty just feels like crap. 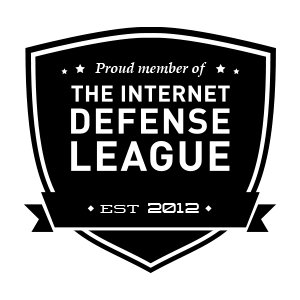 Wednesday – …. – Whoops. If I wanted to really stretch the definition of cross-training, I’d say I took a half hour walk and a 15 minute bike ride. An 8 PM meeting (over drinks!) put the lid on an evening run. Thursday – 6.7 km – I didn’t get home from work til 7, but I still managed to watch the glorious sky change colour along St. Clair during this run. The week after daylight savings time is rough, but the longer evening is such a gift. Friday and Saturday were flops, and that’s all there is to say about that. Friday’s excuses were pretty stacked and buyable. I’ve got nothing but an embarrassed shrug for Saturday. Sunday – 8.6 km & gym – Back on my A game. Breakfast of oatmeal and coffee, then a long run at a fairly even pace. Home for a smoothie and some kale salad, laundry, trip prep (10 days to go!). Then an evening at the gym on the weight machines. Lots of abs. 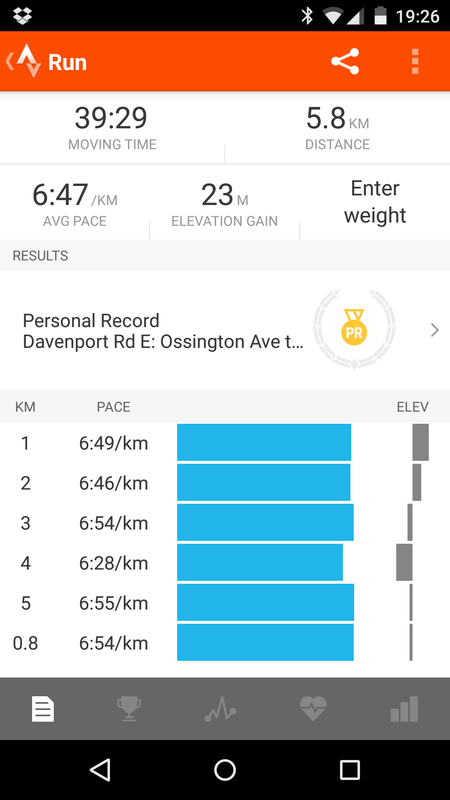 Monday – 7 km – This was one of those runs that just felt great. I was properly fueled, it was raining but not too hard, I had a lot on my mind, and I just ran and thought and planned and it was three quarters of an hour of perfect simplicity. It was a “why I run” run. 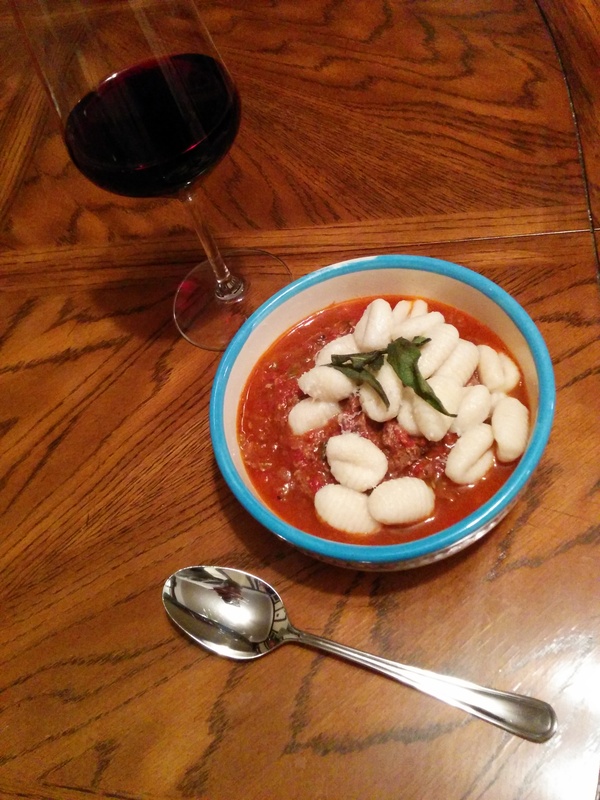 Coming home to find my husband had opened a bottle of wine and put on some oxtail stew and gnocci didn’t hurt my vibe either. Points for taste and presentation to Jonathan. Thursday – 6 km – Absolutely miserable. The opposite of Monday— a run where nothing felt good at all the entire time. I’m proud of myself for not quitting, because I really, really wanted to. I’m not sure what was up—a bit of PMS, legs tired from cycling, improper fueling (though I felt I had some good snacks! ), maybe just one of those random off-nights. Anyway, I got home and felt very glad I had a couple of easy days ahead. Saturday – 8.4 km – Decided to do my long run a day early, as we’re having overnight guests whose presence…erm…probably won’t encourage going to bed at a reasonable hour tonight. I wasn’t super in the mood so I listened to music, a rarity, and set a destination (the city’s best liquor store, wahoo!). And then the sun came out and everything felt great, except I had to pee the whole damn time. 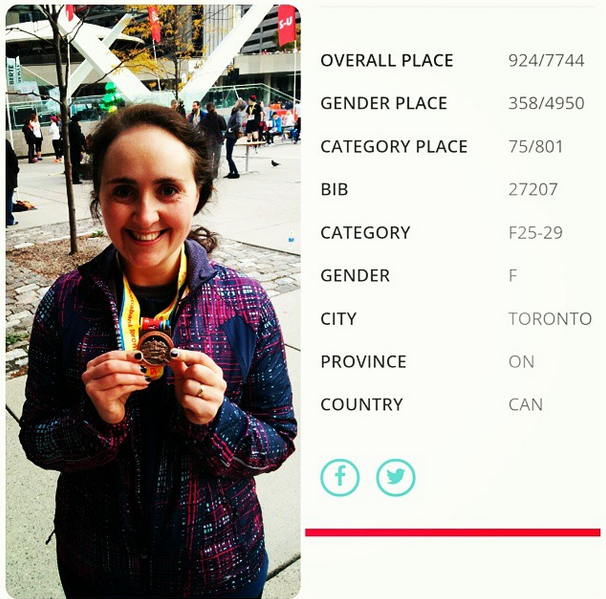 I made pretty good time (for me), with an average pace of 6:34/km! I’m realizing I need a lot of warm-up to feel good while I’m out. Nothing exciting over here, though it’s sunny and maybe only minus 2 today. It’s a lot of exercise, but so far it hasn’t been hard to fit in. Sunday – long run – The long, slow, run that wasn’t slow (in an elated state, I wrote about it here). Tuesday – 5 km – An incredibly slow and painful morning venture. I felt the opposite of everything I felt on Sunday. I’m not a great morning runner, and some combo of that, weakness after Sunday’s enthusiasm, and the gym the night before made this a truly unrewarding slog. 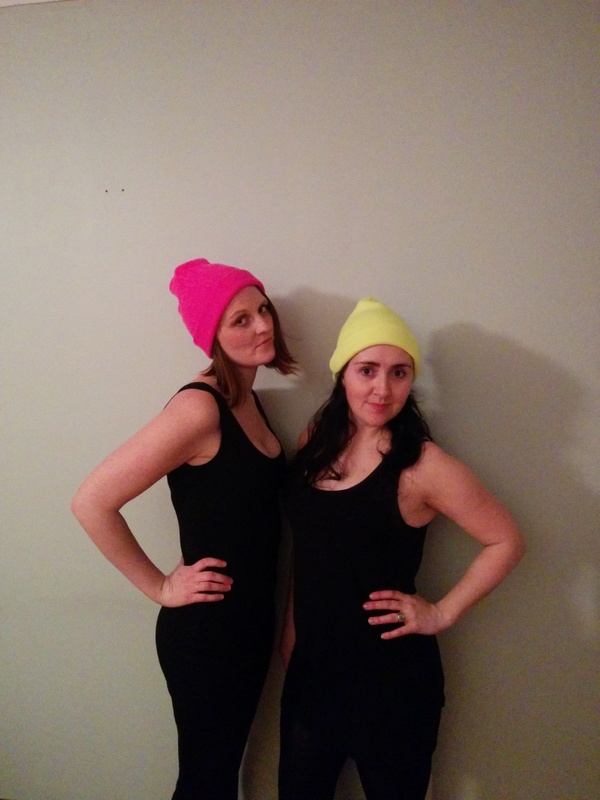 Wednesday – 4.5 km – Evening runs are always better. And I managed to work an errand and a quick visit to a friend into the route. A destination sure helps! Thursday – 5.8 km – Average pace of 6:47/km a little faster than I’ve been, though still not very consistent. Then again, the only kilometre that’s a real outlier is the one down a hill—so perhaps I’m not so far off? Friday – Rest – And lo, not a kilometre was run that night. 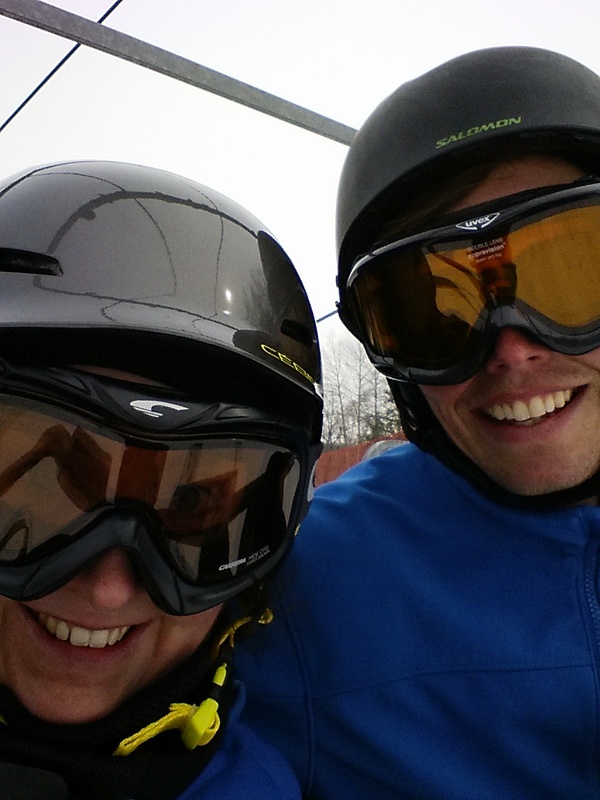 Saturday – Cross training – My mom and her partner invited us to go skiing with them at Horseshoe Valley. Umm, yes! It was sunny and not too crowded when we got there, and only about -4. Perhaps unsurprisingly, towards the afternoon my glute started hurting. Oh, and also everything else. Wrapping up week 2 on the slopes! I’m coming for you, March! I love new beginnings of any and all sorts (well, except birthdays). When a new week and a new month start together, I get especially excited about the possibilities. Hello, March! Today I only wanted to stay inside and look at the internet, but I kicked myself out the door, and found that my legs had never felt more ready. For the first time since I was on Couch to 5k, it was my lungs holding me back, rather than my muscles. And in the end, I had three astonishing new records! wow, Jacqueline, how did you do this!? This is it, the beginning of my half marathon training! I’m following a slightly modified Hal Higdon Novice program. The Higdon program is a bit low on mileage, compared to a lot of other training plans. I chose it because I still have occasional niggling glute pain, which made me very nervous and cautious in getting ramped up, and my base is not what it should be. With this in mind, my main goal for my first half marathon is to feel good. If I could feel good and come in at under 2 hours and 15 minutes, that would be a sweet bonus. Yup, that’s six days a week. Eek! I’m a little worried about fitting it all in, but lots of people with busy lives do it, so I need to make a solid effort! This will be especially hard when I’m on the west coast for three weeks, though running in California sounds like a total dream about now. Anyway, that’s the plan! So how did week 1 go? It used to be that when I saw someone slogging along on the street, I assumed they were both insane and close to death. “Why would you torture yourself like that! ?” I would want to yell. Well, now I am that slogger, but the truth is that it’s only a slog some of the time, and even when it’s awful, it’s one of my greatest joys. This sounds really obvious in retrospect, but it wasn’t to me! The biggest misconception I had about running was that the point of the sport was to run as fast as possible. So once a year or so I’d decide to give it a try. I’d start running, and about ten minutes later I’d barf. And then I’d be sore for days, and vow to never do such a thing again. How could people subject themselves to such horror? Why on earth would you do something that made you feel like you were dying the whole time? So, even though I shouldn’t have run the 5k at the Waterfront marathon…I ran the 5k at the Waterfront marathon! And it was awesome! And now I can barely walk! In desperation, I got a last minute physio appointment late Friday. I was prepared for the worst, but also not-that-secretly hoping for some kind of miracle cure. And I pretty well got it! He said my pelvis was tilted, making one leg longer than the other and causing a glute muscle to spasm. He worked the pelvis back in to place, gave me some stretches, and said there was absolutely no reason I couldn’t run on Sunday. But every time I tried to start running, just to test myself out, it hurt and I stopped. That was probably a clue that I should stay on the sideline, but I was at that point over-the-top excited, unable to rationally consider my options. My first big race! On the lake! And then right through the heart of downtown! I couldn’t stay off Twitter and Instagram, where hundreds of excited runners were posting about their last pre-race run, their meals, their outfits…so many little details that are probably mindlessly dull, in general, but that I couldn’t stop checking out. I even posted my own! I set my alarm for 5:20, but woke up ready to go at a few minutes after 5. Bagel in the toaster, coffee on the stove, then into my clothes and onto the foam roller. Desperate times, desperate measures! I was really, really nervous, but kept trying to remind myself that the worst thing that could happen was that I’d have to stop. That was it. Lucky me, my mother drove me to the race! Better than that, she had a winter coat in the car I could wear until close to start time. It was 3 degrees downtown, and probably colder near the water, so I was very, very grateful for that. 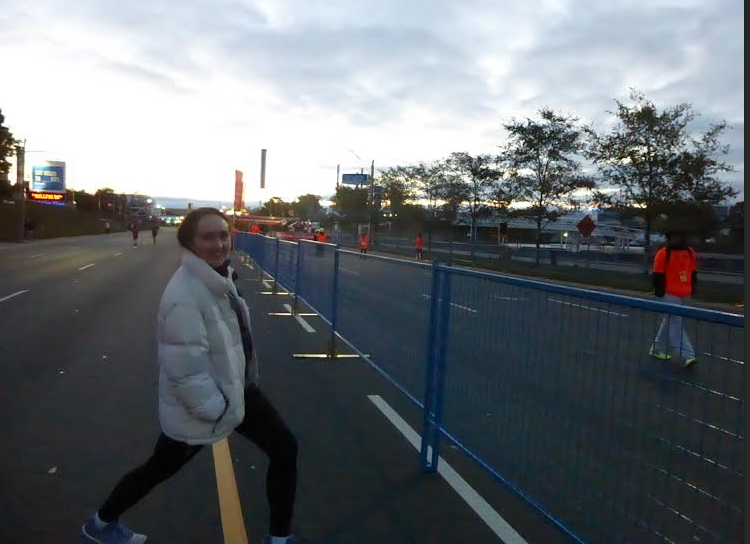 It was still fully dark out when we arrived, and we’d parked pretty far from the start line, so we walked along the edge of the road, stopping to exam the elite beverage set up (the 5k went through kilometers 16 to 19 of the full marathon, and 16 to 21 of the half). The only other race I’ve run is the Longboat Island run, which was wonderful, but very small and chill. This was my first large race: almost 8,000 running the 5k, and close to 30,000 runners overall. My first corrals. My first wave-starts! I guess I was too early? I swear, it was after 7! I was in the first of five corrals, for those estimating they’d finish in half an hour or less. This must have been a walker-heavy event, because I am not what you’d call first corral material. At 3 minutes to 8, we sang the national anthem in our places. Then we were on! Shuffle, shuffle, shuffle, then across the start line and off! I wasn’t exactly in pain, but I could certainly feel my hip, and I tried to slow myself, to enjoy it while also paying attention to what hurt. Running along Lakehshore Boulevard, normally a veritable highway, was a wonderful novelty! And then we were running right past the Skydome and the CN Tower, and I felt so in love with my city (a feeling that’s been hard to come by lately), and so happy to be part of this huge group party. I was going faster than I thought I’d be able to, and by the third kilometre I decided I didn’t need to try to pace myself anymore—I was going to make it! Turning up onto Bay was wonderful: less than a kilometer and a half to go, with Old City Hall in the distance promising a finish line. Up through the tunnel past Union Station, then between the skyscrapers, with the road just for us! It was magic. In the last 400 meters I started to pick up speed. I also started looking out for Jonathan, who’d said he’d cheer me on, and there he was just south of Queen. I felt freakin great! Great! Lesson learned from my first big race: you can’t really pick up speed near the end. All those wide streets narrow into a much narrower finish line, and there’s no pushing through. I crossed the line in 28:07. Not my best time, but I’m satisfied, since I know I held back on a number of fronts. I will get in under 27 next time! I was running fairly even splits of about 5:40/km until the last kilometre, which my Garmin swears I did in under 4:00/km. I can’t really remember it being any faster, but I guess that makes sense given my final time. Basically, my legs were soooo ready for this. Unfortunately, my hip was not. I got a medal and a juice…and then I realized I almost couldn’t walk. My hip felt so twisted, I had to lie down in the grass next to the exit chute and try out some of my stretches. Not good. I got my snack bag and my chip time, then met Jonathan and hustled in to City Hall to warm up. To have had my mom at the start and him at the end really hammered home what a supportive family I’ve got. I felt so happy and loved! After some more stretching and a stop for coffee, we headed back towards the finish line to cheer on Leslie, who was running the half marathon. She’d been having a lot of IT band issues, so we weren’t sure when we’d actually see her, but it was fun to see the early half marathoners come in, looking so powerful and not at all spent. The crowd wasn’t massive, but it was super enthusiastic, and runners looking for some love 200 meters from the finish certainly got it. In 2008 I was in New York for the marathon and discovered by accident that I freakin’ love marathon cheering. Seriously, it is one of my favourite activities (the “Obama will probably be elected” zeitgeist definitely made that one extra special, but I will cheer on any running event, truly). This was my first time cheering as a runner, and while I loved seeing peoples’ outfits, expressions, and names on their bibs, what I loved most this time was seeing their gaits! There may be one best running form, but people seem to do well enough with a wide, wide variety of torso positions, foot angles, and stride lengths. Leslie ran in really good time (1:47! ), and then we stayed to watch the first few marathoners coming in. All of Bay was blocked off, but half marathoners were kept to the left west side, and I hadn’t been sure why, beyond it being an emergency route. Then starting at a little after two hours, when a few police motorcycles whisked through, I realized it was the path for the elite full marathoners, so they could push themselves at the end without dealing with a crowd. The first runners came past us 2 hours and 7 minutes after they’d started running. I felt genuinely privileged to be able to watch them in action. If you’re able and even remotely interested, I highly recommend being part of the fun next year, even if you do a walk/run 5k. I am so excited to go back a bit more seasoned! Thank you to everyone who makes this marvellous day possible! Walking has not been so good since. Am I stupid to say I have no regrets? I wanted to run so badly and I had so much fun! But I returned to the physiotherapist today, who said I had a sprained pelvis. Ah! Technically, I guess it’s the ligament running through the hip that’s sprained but…yeah, it feels really bad, and I can’t run at all now for awhile. But I’ll be back! And I’ll be careful! And I’ll be fast!